My mother was her own force of nature, and tragically, wholly unexpectedly, and thankfully without suffering, she died on Saturday. To say our family is in shock is an understatement. My mother lived life on her own terms, both for the better, and at times for the worse, but there was never an instant in my life where I didn't know how fiercely she loved me, nor where I didn't love her back. A theoretical physicist who received her PhD from the University of Toronto she was a trailblazer for women in science. Her work in science is baffling to me. I read the titles of her papers, and while I understand some words here or there, they might as well be written in a foreign language - one of her students told me that this paper is one of which she was especially proud. She once explained to me how it was she went about choosing what to study. The gist was that she would look at experimental results that people could not explain, and then if she thought that the solution would be mathematically elegant, she'd get to work. And while I may not be telling that story perfectly accurately, that's how I remember it anyhow. We've no doubt, that had it not been for mandatory retirement (she missed its abolition by 2 years), she'd have still been teaching. It was my mother who taught me, again for better or for worse, to always speak my mind and not to be shy, even with criticism. Below is the obituary we're placing in the papers - and I thought I'd share it here as well and let it fly out into the ether. Love you Ma, can't believe you're gone, and will always be proud to be your son. Passed away suddenly on Saturday June 10, at the cottage she loved in Muskoka at the age of 77. She will be dearly missed by her husband Stephen of 57 years, her daughter Michal (Michael Van Leeuwen), her son Yoni (Stacey Segal), her brother David Goodman, her grandchildren, Rena, Zahava, Talia, Sammy, Leah, Vivienne, and Yael who adored their Omi, and many nieces and nephews. Sister-in-law of Judith and Aubrey Golden,Sylvia Goodman (late brother Irving), and Doba Goodman. Helen was born in Toronto and excelled in the sciences, having graduated from the University of Toronto with the highest marks and was awarded the Governor General’s Gold medal. 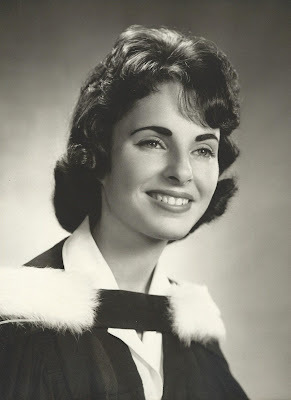 She went on to obtain a PH.D in physics and was appointed an assistant professor at York University in 1967. At the time of her appointment, she believed she may have been the only woman in Canada teaching at the university level in her field. Funeral service at Benjamin’s Park Memorial Chapel 1:30 Monday June 12. Shiva at 38 Alexandra Wood. Morning services daily at 7:45 a.m. Evening services at 8:45 p.m. Shiva will conclude Sunday morning, June 18.